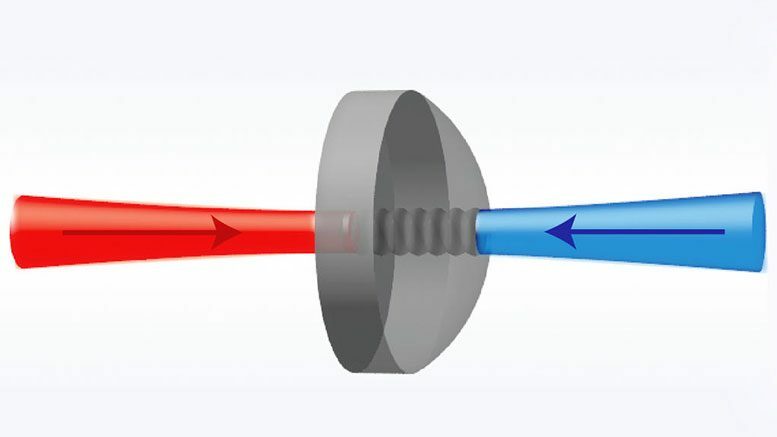 The diagram illustrates light (in red and blue) generating acoustic waves in a pristine crystal (center). Yale scientists used laser light to gain access to long-lived sound waves in crystalline solids as the basis for information storage. The result was published online April 2 in the journal Nature Physics. Acoustic technologies that harness the power of sound are ubiquitous in the modern world. They are crucial elements in everyday technologies ranging from cell phones to global positioning systems. As society transitions to sophisticated quantum technologies that utilize the properties of quantum mechanics, scientists are looking to develop acoustic technologies for applications in quantum computing and sensitive metrology. At room temperature, sound waves usually die out rapidly, making them less appealing for information storage. But at cryogenic temperatures, where many quantum technologies operate, sound waves in pristine crystals such as silicon, quartz, and sapphire can last much longer. The new study, led by assistant professor of applied physics and physics Peter Rakich, describes how such long-lived sound waves can be both efficiently generated and controlled using laser light. William Renninger, a former member of the Rakich lab who is now a professor at the University of Rochester, is the study’s first author. “This surprisingly simple system combines aspects of classical nonlinear optics and quantum cavity optomechanics to enable exciting techniques for state-of-the-art devices in addition to avenues for fundamental exploration,” Renninger said. The researchers said there is a potential for commercial application of these acoustic devices. A laser based on sound could enable new approaches for precision time-keeping in modern communication systems. In addition, “such interactions between light and sound in specially engineered crystals could enable new devices for future quantum networks,” said Prashanta Kharel, a graduate student in Rakich’s lab and co-author of the study. The Office of Naval Research, the Packard Fellowship for Science and Engineering, and the National Science Foundation supported the research. Be the first to comment on "Physicists Use Laser Light to Gain Access to Long-Lived Sound Waves"